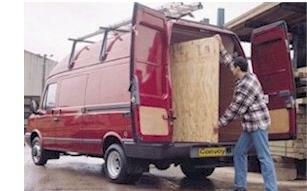 C onvoy - of UK commercial vehicle production, has got frame construction, with solid front axle and rear axle drive. Fited with powerful diesel engines with direct injection 2.4/2.5l Di and TDI. corresponding with strict Euro standards. 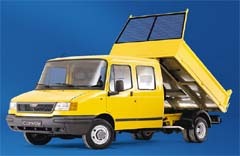 For all models are warranted 2 years on mechanical parts, 4 years on the body and paint for two years. The first service is free. 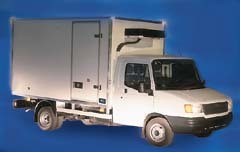 C onvoy chassis designed for completion are simple, versatile as a flatbed, tipping, ALU or laminate cabinets with hinged or roll-up doors, refrigeration and freezer cabinets, as a tow truck and other special bodies. 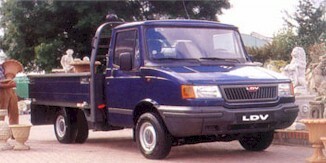 The cabins are three or seven-seater, spacious, comfortable and safe. 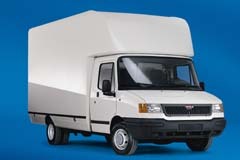 The choice of three (L, XL, XXL) in various wheelbases, with different lengths of body, chassis in various load capacities with dual wheels on the rear axle. 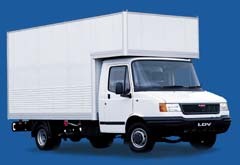 LDV Convoy trucks are for completion of multiple uses, offering a wide range of bodies from the truck with and without a sail, or dump trucks, fiberglass and aluminum enclosure, box trucks for bakery, refrigeration, flue or fixed platforms are tipping, tractor-trailers, scissor lifts and other auxiliary facilities.